Lockerbie Square, where many immigrants built their homes, is the oldest remaining residential neighborhood in downtown Indianapolis. The district includes fine examples of vernacular cottages as well as high-style brick residences from the mid to late-19th century. This quiet enclave provides visitors a glimpse into life in early Indianapolis. The oldest portion of the district is located in the original Mile Square dating from 1821, when the city was platted with an area of one mile square. East Street, the eastern line of the original Mile Square, defines the western boundary of the district. Lockerbie Square was among the earliest “suburban” developments, still an easy walk to the heart of the city. The name of the district comes from Lockerbie Street, which was named after the Lockerbie family, who platted out portions of the district. Though many land holders here were Scots-Irish or Scottish in ancestry, settlers from the German states soon found home here in the 1840s and 1850s. Newspapers referred to the area as “Germantown” in the 19th century. The most famous resident of Lockerbie Square was James Whitcomb Riley, who was widely published and revered nationally for his Hoosier dialect poetry. His home is designated a National Historic Landmark. Riley was a renter at the house of Major and Mrs. Charles Holstein. The mansion was built by John Nickum in 1871-72, using in part profits from his bakery’s contracts to supply crackers to the Union Army during the Civil War. Riley lived there 23 years during the height of his popularity. His poems such as “Little Orphan Annie” and “The Raggedy Man” captured the lives of common people and looked back nostalgically to the simpler times of his childhood. Nearly every school child was well acquainted with Riley and his verse. He toured the midwest frequently performing readings and sketches on many an opera house stage. At 528 Lockerbie Street, the classic Italianate Riley home designed by R. P. Daggett is a museum, preserved from Riley’s time with original furniture, belongings, and finishes. Typical of Indianapolis in this period, skilled workers lived side by side with wealthier families. Just down the street at 538 Lockerbie stands the 1863 Johan Despa House, a typical Lockerbie gable-fronted cottage with simple Italianate details. Despa was a house painter who emigrated from the German states. Just around the corner at 407 North Park, Herman Lieber, another German immigrant, bought a lot and built a bracketed wood-frame cottage about 1860. This unusual “Swiss Chalet”-like house could have been inspired by illustrations in one of A.J. Downing’s house pattern books, or perhaps by Lieber’s homeland. The 1859 Joseph Staub House, 342 North College Ave, is a brick, vernacular side-hall plan house, with simple Greek Revival elements that recall the form of many earlier dwellings in the city with a two-story side gallery porch once common on Indianapolis homes of the 1830s–1860s. Staub, a German settler from Cincinnati, was a merchant tailor and made Union uniforms in this house during the Civil War. German residents continued to build in Lockerbie Square during the 19th century, but few homes were constructed after 1910. In the 1920s, industrialists began to encroach on the neighborhood. Buildings like the Indianapolis Glove Company factory at 420-430 North Park, now condominiums, became more common and often claimed the sites of houses. By the eve of the second World War, Lockerbie Square was filled with boarding rooms, and most of its houses were in decline. Preservationists focused on this district as one of their first efforts in the late 1960s, and the restoration of neighborhoods took root. The Indianapolis Historic Preservation Commission has guided the rehabilitation of the area. Lockerbie Square Historic District is an easy walk from downtown and is bounded by East St., I-65, New York and Michigan Sts. Homes and businesses are private and mostly not open to the public. 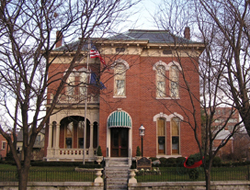 The James Whitcomb Riley Museum Home, a National Historic Landmark is at 528 Lockerbie St. Click here for the National Historic Landmark registration file. It is open to the public to experience turn of the century high society. Hours are Tuesday—Saturday, 10:00am to 3:30pm, Sunday: Noon to 3:30pm. For group reservations, call 317-631-5885. 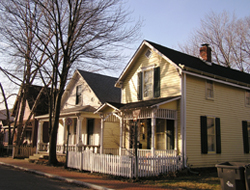 The Despa House, Holler House, House of Crane Building, James Whitcomb Riley House, Joseph W. Staub House, and Webber House have been documented by the National Park Service's Historic American Buildings Survey.